This thread is to collect all of people's ideas for UI improvements. Some of it is my ideas/concerns and what I've seen talked about in game. Most of it are additions to the forums or comments to this thread that I've added as I've seen them (credit given to the authors). Collection is too small and hard to browse, deck cards are too big by comparison, and the main desires of the community are the ability to filter/sort for soulbound vs non-soulbound and by rarity level. AllenJB made a few suggestions: 1) Ability to import/export deck lists to a file 2) Ability to browse all available cards in the game 3) Maintain a list of recently obtained cards, perhaps from the last 24 hours or so. 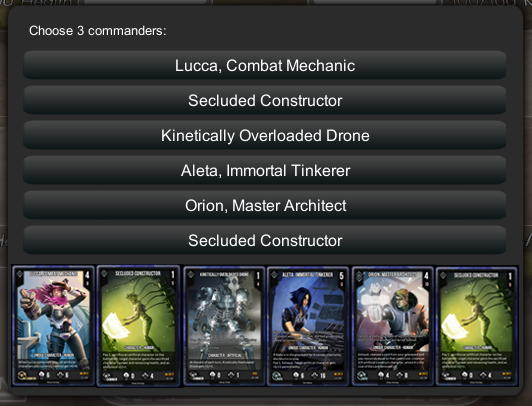 The_Fallen has suggested (and many people have voiced the same need) the ability to sort or filter by any stat of a card (subtype, resource cost, morale cost, power, health, etc.). Lilo has given some suggestions (here) that include a morale cost and/or power curve next to the resource cost curve and a separate visual slots in a deck for different card types. Coolcor has suggested that legal cards take into account the Deck Legality setting. Also the ability to sort decks by legality (or sort decks at all) would be nice. I'd like to see a buff to the graphics. I play on max resolution and compared to everything else the chat graphics look fuzzy like they've been blown up too big. Invite to Trade and Invite to Game buttons should be enclosed in the window instead of attached to the top. They look like they were added on at the last minute and can be hard to read on a busy background like the Deck Builder. Status symbols/messages/colors would be awesome. As it stands I have no idea if someone's in game, away, doing draft, opening packs, playing campaign, dinking around in main menu, etc. when I want to pick someone to ask to help me test a deck. It would also give players a general idea of what most of their friends are up to at a glance. Noobshock suggested in a comment to this thread the ability to have multiple chat windows open at once, particularly Global and Trade. Agrivane made several suggests for chat: 1) Automatically select the text entry field when opening a chat 2) Automatically select the text entry field after hitting the + to add a new friend 3) Allow Enter to submit a new friend in the friend text entry field 4) Allow copying to clipboard in chat. AllenJB suggested having the option to make chat visible all the time. 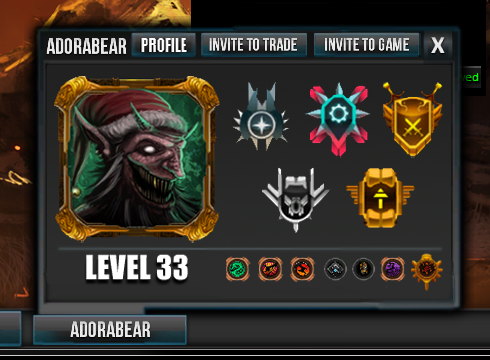 Adorabear suggested the following changes in a comment to this thread: 1) Ability to customize what medals/borders are displayed during loading 2) Ability to view a player's profile through the chat system both in and out of game. NatoPotato has suggested an addition to Adorabear's idea where only the player can see their customized medals and the opponent still sees their highest ones to prevent people hiding skill. Falkenstein has suggested (in a comment to this thread) users being allow to add a language(s) to their profile to facilitate easier communication. Most of us have noticed the terrain on locations clipping into cards and making them difficult or impossible to view without selecting them. I'm pretty sure this came about with the battlefield's graphical upgrade. It would be nice to see some fine tuning on this. Similarly there have been several suggestions on how to deal with too many cards in one zone making it difficult to view them. Balaznar made a suggestion (here) to use the existing graveyard viewing system on zones with too many cards to easily see them. On the same post Tomoyuki added an idea for visually separate placement/zones for locations and artifacts. AllenJB suggested in a comment to this thread grouping like cards together into "stacks" and allowing them to be moved together or split into multiple stacks. 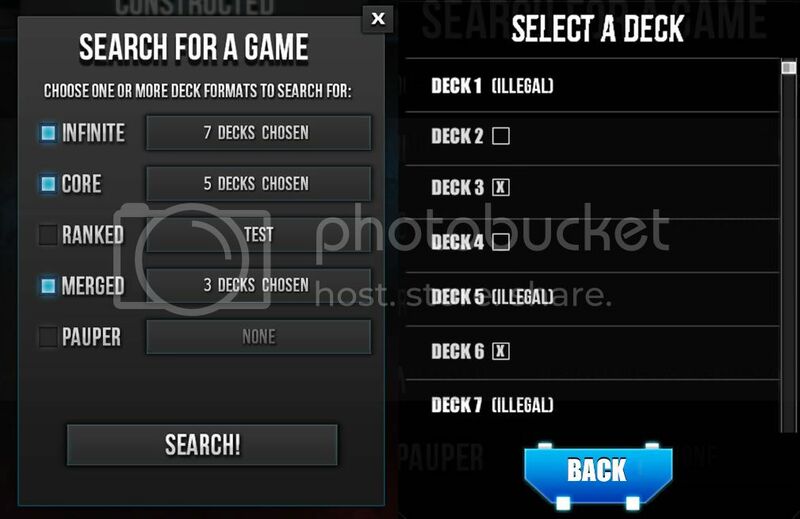 AllenJB also suggested having a way to view all cards that have been removed from the game. In a conversation with Noobshock, we spoke about bringing back to the old Activity Log that used to be a tab on the right to provide that information to players again about the events and interactions in their game. Particularly for new players that don't understand everything about the game yet. Coolcor also added in a comment to this thread the idea of using mouse commands to view and interact with cards: "During the game I would like it if the mouse-wheel was used to bring up the zoomed in view of a card. Then left click could be used to just play the card without having to drag it or click more than once. Right click can be used to bring up a small menu to activate an abilities on the card". Agrivane suggested allowing cards to play out at a set rate when a turn ends instead of clicking on them. He also suggested allowing multiple cards to be selected in the graveyard where applicable (ex. Xi), it would be nice to have more visual feedback on what has been selected as well. A smaller change would be to move the timer into the blank area in the top bar above its current location. Saith has suggested being able to zoom in on the field (like in mobile!) and perhaps that once the command zone is emptied that it be removed and the support zone enlarged for ease of use. NatoPotato has suggested (url=http://forum.lightmare.com.au/index.php?topic=18067.0]here[/url]) the ability to show counter like percentages when zooming in on a card. As proud as I am of the quests I've already completed, I'm not really interested at looking at them anymore. It'd be nice if by default they either didn't show up or were automatically at the bottom of the list so a player doesn't have to scroll to see what quests they have left to complete. On the profile screen, there is a blank section to the far right of "QUEST LOG" that is just begging to have a completion percentage for the quests in it. Like a "43% completed" or "87/110" to tell the player some overall progress they've made in the quest system. Similarly, at the top level of the quest log, the large box which normally displays a quest is completely empty wasted space. It'd be awesome to use it to display a quest(s) that the player is close to completing and/or the latest Weekly Quest. This gives players an immediate goal to try if they're unsure what to do in game and gives a sense of progress in the quest system. Palaxar suggested (here) that sections in which you've completed all the quests should light up gold the same as an individual completed quest for easier feedback to the player and an added sense of accomplishment. DefenestratedCow suggested (here) including end dates/timers on weekly quests and event quests so players are aware of the exact time constraint. Possible ability to "request" / "tag" cards while scrolling through the other person's collection so they can easily see what you're interested in / looking for. 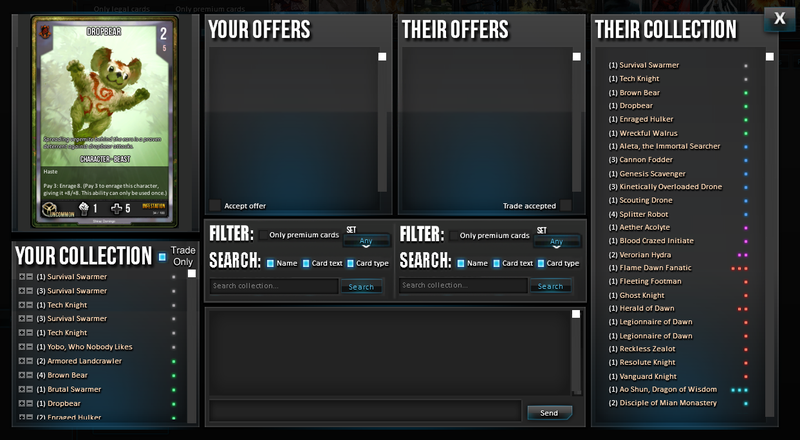 mik1o suggested an upgrade to the trade window (here) to address problems with remembering the number of soul bound copies of a card a player has and for easier collection sorting by adding a list of soul bound cards for only their owner to see along with filters for both player's collections. Images are included in his thread. Noobshock suggested (here) allowing the usage of the arrow keys to navigate the trade lists. Possible extensions of this could apply to other parts of the UI as well. Agrivane suggested clearly displaying your trade partner's name during trading. Qfasa suggested that premium cards which are particularly scarce be listed somewhere with the total count of them that exist in the game. This could possibly be add with the Auction House. Several requests have been made to display the number of soul bound copies of a card next the to corresponding tradable card. Agrivane suggested a few changes to the screen for starting a game: 1) Add an audio signal when an opponent is found 2) Add animations to the buttons featuring characters. There have also been suggestions for telling a player when they're loading into game what mode they're in since Infinite, Core, and Ranked can all look the same for the first few turns of the game. AllenJB suggested maintaining a list of recent purchases, at least those made with LP. Specseek suggested (here) a list of recent transactions to include trades and quest rewards, not just purchases. Possibly with a weekly email option to keep track of your account. Noobshock has suggested moving the soulbound lock to make it easier to see the rarity symbol and making the color differentiation between common and uncommon greater. He also has mentioned having a way to view cards full-sized (the size they are when you open boosters, getting them from quests, or "zoom in" in game), possibly in the deck builder. Agrivane has requested an option to make Gold and Plat effects static to be easier on a player's eyes. Adorabear and DrayGon777 have requested that premium token generation cards should generate premium tokens of the same type. Ceces has suggested an option to remove the text that covers card art to provide a better viewing experience for players that know the cards. Would like to add a trading window section. Best idea I've seen for this from this thread. What I mean to say is, great job. I was gonna make a whole new post about this idea but it can go here instead. When the new chat came in a couple weeks ago we lost the ability to see what level people are. We also gained the ability to gain medals which the patch notes say are intended to be for "showing off" and I take that to mean its supposed to be a vanity/aesthetic feature. Only problem is that different people like different things. Personally green and pink is not my favorite colour combination i much prefer the diamond or gold medals and would like the ability to display what medals I personally like. Some people also like colour coordination too and would prefer to have all their gold medals displayed rather than 2 gold medals 1 diamond and 1 platinum. Id also like the option to not display medals sometimes since it can actually really effect the game if you opponent is intimidated/overconfident by playing against someone who has far more/less medals than them. This game is so much about mind games and I think the mind games ideally shouldn't start before the game does. Avatars, Titles, Cardbacks, and deck effects are all customizable and optional so I feel that Medal and Borders should also be. Someone raised the issue that they didn't feel comfortable with people 'hiding' their skill level so this leads into my second supporting idea which is that there be a place where you can view a players profile. Its nice to be able to see a players level and this would be a great place to be able to view all of a players achievements in the form of medals and borders and levels and trophies and all that. UI wise I would put a button on the PM chat window which flips the chat box to show their profile and clicking the button and flips it back to the chat. That way you can easily see how good your opponent is if you want to/care but people are still free to customize their loading screen to suit their tastes. I'll be adding more concept images later. Stay tuned! Like the concept, though. Even shows the faction loyalty badges. Thank you for your interest, but *whispers* there's a "notify" button on the top right of the thread. I'm honestly not sure why people are concerned about post counts. I figure they build themselves up over time and are probably better when you are actually adding something of relevance to the conversation. Granted, I probably do have a few posts that aren't that great, but sometimes you just have to post agreement with something to show that the idea has merit. -Ability to have multiple chat windows open. This is a must for comfort while out of game (but also in game lol). Shouldn't have to choose between following a conversation with a friend OR having trade/global chat open. Hell I want both trade and global, so I can have fun reading and participating in global while doing trades or w/e. Most screens are wide these days, there should be an option to have multiple open windows.